Midland Lead has worked alongside Timby Roofing for a number of years. We got the chance to catch up with him recently to share his tips on how to work effectively and safely with lead in construction. Since his days training as a roofing apprentice at Leeds College of Building, founder and owner of Timby Roofing, Matt Timby, is a specialist roofing contractor and has become a respected figure in the construction industry. Throughout his career he has been awarded a number of honours, including NFRC National Roofing Awards alongside achieving gold medals at both National and International World Skills Events. Midland Lead and Timby Roofing share the same values of sustainability, protecting the environment and using lead in construction and heritage projects. Matt Timby is an advocate of using lead, and as a specialist roofing contractor he talked to us about the qualities and long-term advantages of using lead; “Lead is a great material to work with, and when specified and installed correctly, it lasts a lifetime. In fact, lead will easily last more than three times longer than lead alternatives, making it a very cost-effective material. “Lead alternatives do have their place in construction and there are many to choose from. They are generally used on flashings or on some developments where prices are tight, but none of the alternatives perform as effectively long-term. Lead is a material that needs an experienced handler to ensure that it is installed and finished correctly. When you are looking to hire a lead roofer, make sure they demonstrate evidence of previous work, ideally with recommendation. They should also be qualified with recognised bodies such as City and Guilds leadworkers certificate or an NVQ. It is also advised that they are members of recognised trade organisations such as the Lead Contractors Association. An experienced contractor should be able to confidently talk through, make recommendations and demonstrate what’s required for the specific project. The use of lead sheet is the same as any other roofing product, you have to know when and how to use it to ensure that it is installed correctly. If you are unable to find an experienced or qualified lead installer, then my advice is to become one – you will never regret knowing more about lead as a great building material. There are plenty of short courses all over the UK that will help you learn foundations for the basics. You can also buy a copy of the ‘Lead Sheet Manual’ from the Lead Sheet Training Academy, although this deals purely with rolled lead sheet to BSEN 12588, it can be used exactly the same way for machine cast lead and is an essential document that can help with specification and detailing. 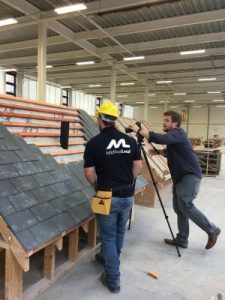 Another point would be that if in doubt, ask the manufacturer, such as Midland Lead who are very knowledgeable on all types of projects, or another contractor for advice, a two-minute discussion can save a lot of issues. There are a number of ancillary products that can be used to improve the appearance and longevity of lead installation. Lead ancillary products can really help to make preparation, installation and looking after lead a lot easier. There are many products available, such as woodcore rolls, building paper or underlay, and all are essential in their own rights. Patination oil is also a great way to ensure even weathering and prevent white lead carbonate run-off onto other building materials. Midland Lead have an ancillary list that lists all the products that are used alongside lead that can be a great help. When specifying lead sheet, it is really important to refer to relevant documentation to ensure the correct thickness and dimensions of lead is being specified for that particular application. It is recommended that you consult the manufacturer of the product, Midland Lead have a downloadable lead code weight chart that can be helpful – most manufacturers will provide similar. A factor to also consider is the climate and geographical location where the lead will be installed, for instance contractors in Scotland might be better placed looking at codes 5 and above, where projects in England and Wales may only need a code 4 lead. This is simply due to the harsher weather conditions, where a thicker, more durable lead installation is required. We all know that, if handled incorrectly, lead can be harmful to health. Lead particles can enter the body through ingestion and inhalation, but this can easily be avoided with the use of simple PPE (personal protective equipment) and using the product correctly. Gloves or barrier cream should always be used when handling lead sheet, hands should be washed before drinking, eating or smoking. An FFP3 type mask should also always be worn when lead burning, and when conducting this method, lead burning should only be carried out in a well-ventilated area. It’s advisable to wear overalls when working with lead sheet as it can build up on your clothing and transfer to your vehicle and then to your home. Another thing to consider is good manual handling practice as lead, by its very nature, can be very heavy. To guarantee long term benefits it is also important to ensure you observe best practice when storing lead. For instance, checking your lead rolls or sheets are stored correctly before installation is crucial to prevent discolouration. Always keep lead off the ground on raised pallets in an environment that has little to no atmospheric changes for best results. It is essential that lead sheet is fitted correctly to ensure the longevity of the product when installed. Poor installation, as with any product in construction, can result in premature failure, as lead is open to all the elements that weather can throw at us! Poor handling can also damage the product, it is important that the care is taken so not to damage the material when moving, storing and installing. Take care that the area you are working in is clean, rolling your material out onto a workbench, scaffold or roof deck covered in debris of any kind is not advised. Rolling the lead out onto unclean surfaces can cause surface damage or even puncture the sheet. Any damage to the lead itself can affect the long-term properties of the installation. One last thing to note is that there is no better roofing product than lead. Lead is 100% recyclable, non-corrosive and is the most versatile and sustainable roofing product available, but with so much choice it is important to understand why certain types of lead are suitable for particular applications. Established in 2010, Timby Roofing is a multi-award-winning company and a member of the National Federation of Roofing Contractors. They have worked on a wide variety heritage based and modern roofing projects and are very proud of their reputation built during years of trading. Fully qualified, the company is based in Gainsborough, Lincolnshire. Timby Roofing generally work within a 50-mile radius, although they have worked on contracts as far north as Ayrshire and even as far south as Carmarthen in the South of Wales.